We have previously isolated a stable alternative DNA structure, which was formed in vitro by reassociation of the strands of DNA fragments containing a 62 bp tract of the CA-microsatellite poly(CA)·poly(TG). In the model which was proposed for this structure the double helix is folded into a loop, the base of the loop consists of a DNA junction in which one of the strands of one duplex passes between the two strands of the other duplex, forming a DNA hemicatenane in a hemiknot structure. The hemiknot DNA structures obtained with long CA/TG inserts have been imaged by AFM allowing us to directly visualize the loops. Here we have analyzed this structure with several different techniques: high-resolution gel electrophoresis, probing by digestion with single stranded DNA-specific nucleases or with DNase I, modification with chemicals specific for unpaired bases, and atomic force microscopy. The data show a change in DNA structure localized to the CA/TG sequence and allow us to better understand the structure of this alternative conformation and the mechanism of its formation. The present work is in good agreement with the model of hemicatenated DNA loop proposed previously. In the presence of protein HMGB1, shifted reassociation of the strands of DNA fragments containing a tract of the poly(CA)·poly(TG) microsatellite leads to the formation of DNA loops maintained at their base by a hemicatenated junction located within the repetitive sequence. No mobility of the junction along the DNA molecule could be detected under the conditions used. The novel possibility to prepare DNA hemicatenanes should be useful to further study this alternative DNA structure and its involvement in replication or recombination. DNA can adopt alternative conformations which can be very different from the classical B-form double helix. As infrequent as they may be inside the cell, these conformations are of interest since DNA replication and recombination are two processes during which intermediates are formed that present a wide structural diversity. In addition, given the structural uniformity of the classical B-form double helix, alternative DNA conformations might serve as signals presenting a strong structural contrast with the rest of the DNA molecule and allowing a straightforward localization of certain specific sites on the genome. Tracts of the poly(CA)·poly(TG) sequence, also named CA-microsatellites, are found in all eukaryotic genomes, especially in mammalian genomes where they are dispersed in several thousands of copies of up to 60 bp, sometimes much longer. We have studied alternative structures obtained with DNA fragments containing a 62 bp tract of poly(CA)·poly(TG). Under appropriate conditions these fragments can form different structures  which are obtained with low yields but are sufficiently stable to be studied. Some of these conformations are multistranded structures the conformation of which is not yet entirely clear [2–4], some of them being also formed with non-repetitive sequences [4–6]. Other alternative conformations of these fragments are double-stranded structures, called hcDNA, which are the object of the present paper. Previous studies of the topology of DNA strands in hcDNA have allowed us to propose a model . In this model, shown in Figure 1, the DNA fragments form a double-stranded loop which is maintained at its base by a junction in which two duplexes cross, one of the strands of one duplex passing between the two strands of the other duplex. The junction thus formed is a DNA hemicatenane, the structure shown in the model being a hemicatenated loop. Similar structures obtained with longer tracts of poly(CA)·poly(TG) were termed hemiknots in our recent paper where first atomic force microscopy (AFM) studies were reported ; hemiknots appeared as diverse structures among which the looped out structures were found. hcDNA is particularly interesting as this structure is bound in vitro with extremely high affinity by protein HMGB1 (previously named HMG-1 ), a very abundant non-histone nuclear protein in mammalian cells, and the prototype of the HMG-box family of proteins which are implicated in several aspects of differentiation and of embryonic development (for a review see e.g. ). The affinity of HMGB1 for hcDNA is extremely high since a dissociation constant lower than 0.16 pM was measured, with a half-life of the complex longer than one hour , values which are rarely observed for DNA-protein interactions in eukaryotes. Hemicatenated DNA loops. A DNA fragment containing a 62 bp tract of poly(CA)·poly(TG) flanked by non-repetitive sequences from plasmid pUC19 is used. After thermal denaturation, pairing of the opposite strands can occur with a shift. In this case, a transient structure is produced in which the terminal non-repetitive regions remain single-stranded. In the presence of HMGB1 this structure can fold and form a loop, with one of the single strands at one end inserting inside the fork formed by the two single strands at the opposite end. Subsequently, complete pairing of the terminal non-repetitive regions leads to the formation of a hemicatenated junction, in which two duplexes cross with one strand on each duplex passing between the two strands of the opposite duplex, forming a DNA hemicatenane . The possibility for DNA to form hemicatenanes has been discussed and documented in relation with recombination [12–22] or replication [23–26]. However, hemicatenanes have been difficult to study due to the lack of a technique to prepare them. Now that a method permits the preparation of significant amounts of hcDNA , we have studied this structure by high-resolution gel electrophoresis, chemical and enzymatic probing, and direct imaging using AFM. The results allow us to discuss and to refine the model, and to support the mechanism proposed for the formation of hemicatenated DNA loops and hemiknot DNA structures. When analyzed on low-concentration polyacrylamide gels (4% polyacrylamide gels at an acrylamide-bis-acrylamide ratio of 29:1), hcDNA migrates as a few fuzzy bands that are only slightly retarded relative to the linear fragment in its regular linear conformation . The presence of fuzzy bands in gels could be the consequence of structural instabilities resulting in mobility changes during electrophoresis, or to the presence of a set of conformers with different mobilities. Therefore, to better study these bands, they were analyzed on higher resolution gels. 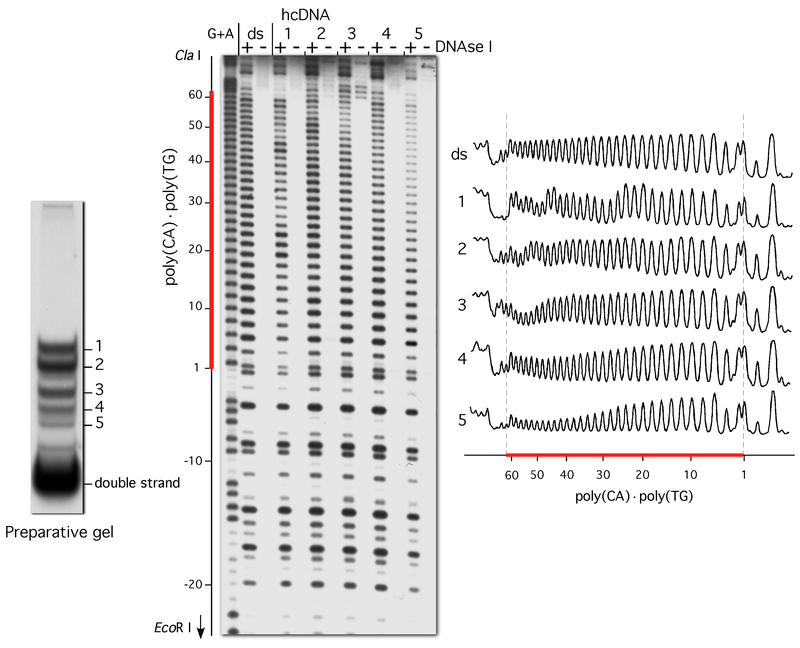 By increasing the polyacrylamide concentration the mobility of hcDNA was strongly reduced but separation of the different bands was greatly enhanced, the fuzzy bands being replaced by a series of distinct sharp bands of variable intensities (Fig. 2A) which are much more retarded than on 4% gels since the slowest band migrates half as fast as the linear fragment on 8% gels, whereas on 4% gels the mobility is only reduced by 12%. Analysis of hcDNA by two-dimensional gel electrophoresis. (A) When analyzed on an 8% polyacrylamide gel, hcDNA resolves into a series of discrete bands. In contrast, hcDNA only formed a few fuzzy bands on a 4% gel . (B) The first dimension shown in (A) was cut and loaded on a second gel (4% polyacrylamide), with or without DNA denaturation by heating the gel strip at 100°C. Without denaturation (left), hcDNA appears as a series of well-defined spots. After denaturation (right) all hcDNA spots show the two strands of the DNA fragment in equal amounts. The positions on the gels of hcDNA, of the linear double-stranded DNA fragment (linear double strand), and of both single strands (CA strand and TG strand) are indicated. In an attempt to detect structural differences between the different bands, this analysis was refined using two-dimensional electrophoresis. After the first dimension electrophoresis on 8% gel, gel slices were cut and loaded on a second dimension 4% gel either directly, or after DNA denaturation by incubating the gel slice for 5 min at 100°C. The analysis of the non-denatured material (Fig. 2B, left panel) shows at least 10 spots, some of which are very weak and could not be detected in the first dimension. After heat-denaturation, all the spots are found to contain both strands of the DNA fragment in stoichiometric amounts (Fig. 2B, right panel). Therefore, no change of conformation during electrophoresis can be detected and the 2-dimension gels show that hcDNA consists in a series of stable alternative conformations of the DNA fragment. To get more information about the structure of hcDNA and the differences between the different bands, hcDNA was then studied with enzymatic and chemical probes capable of sensing alternative DNA conformation. The model (Fig. 1) involving a partial opening of the double helix at the hemicatenated junction, we probed hcDNA with S1 nuclease, the most classical enzyme for single-stranded DNA regions. 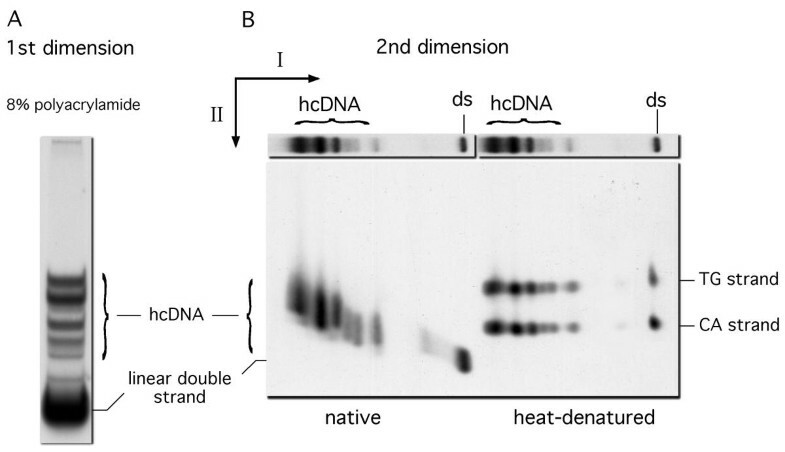 For the experiment shown in Figure 3, the DNA fragment was labeled at one end and converted into hcDNA that was fractionated on polyacrylamide gels. Total hcDNA was purified on a 4% gel, while the two major hcDNA bands were purified in parallel on an 8% gel (see Fig. 2A, first and second band from the top). hcDNA was digested with S1 nuclease and DNA analyzed on a denaturing polyacrylamide-urea gel. Linear DNA was digested in parallel as a control, and a G+A chemical reaction on the same fragment was used as a size marked. The results (Fig. 3A) clearly show that hcDNA is preferentially digested in the poly(CA)·poly(TG) region, no preferential digestion can be seen outside of the repeat. The patterns of digestion of bands 1 and 2 and of total hcDNA are very similar and do not point to any major structural difference between the two major bands. A striking feature of the digestion pattern is the fact that 10–12 bases on each side in the repetitive region are not cut by the enzyme, suggesting that the opening of the double helix in hcDNA never extends to the very side of the poly(CA)·poly(TG) sequence. hcDNA was also probed with the single strand specific P1 endonuclease. This nuclease is active at neutral pH and is insensitive to the presence or the absence of divalent cations, whereas S1 nuclease requires a low pH and the presence of Zn++, conditions which are far from the physiological ones and not very suitable for the study of DNA-protein complexes. The only technical drawback of P1 nuclease is that it cannot be inactivated with EDTA. Total hcDNA was digested with P1 nuclease in the presence or in the absence of HMGB1, with the single-stranded and double-stranded DNA fragment as controls (Fig. 3B). The most striking feature of the nuclease probing pattern is that the middle part of the repeat is digested with the enzyme whereas its flanks are resistant to the enzyme attack, like with S1 nuclease. In addition, a region of weaker sensitivity is found in the center of the repetitive region, with two peaks of sensitivity which are centered around nucleotides 23 and 40 for the sample digested without HMGB1, while in the presence of HMGB1 the two peaks are slightly more pronounced, centered around nucleotides 22 and 44, with a clear decrease in sensitivity in the middle of the repetitive sequence. Analysis of hcDNA with single-strand-specific nucleases. 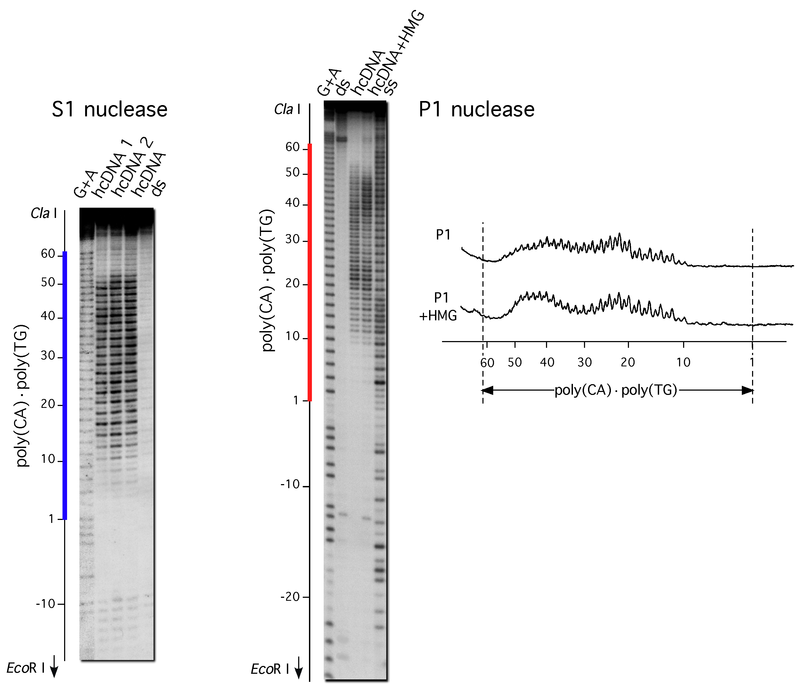 hcDNA radioactively labeled at one end was digested with S1 and P1 nucleases and the digestion products were analyzed under denaturing conditions on a polyacrylamide-urea gel. Note the two sensitive regions inside the poly(CA)·poly(TG) tract. A G+A sequencing reaction on the same fragment was used as a size marker. In the experiment with S1 nuclease, hcDNA was 3'-labelled at the Eco RI site. The samples were: G+A: size marker; hcDNA1: upper major band of hcDNA (see Fig. 2A); hcDNA2: lower major band (id. ); hcDNA: total hcDNA; ds: double strand. In the experiment with P1 nuclease, hcDNA was 5'-labelled at the Eco RI site. Samples were: G+A: size marker; ds: P1 digestion of the linear double strand; hcDNA: digestion of hcDNA with P1 nuclease in the absence of HMGB1; hcDNA+HMG: digestion of hcDNA with P1 nuclease in the presence of HMGB1; ss: P1 digestion of the single strand. Scans of the samples digested with P1 nuclease in the presence or absence of HMGB1 are also shown. In summary, both S1 and P1 nucleases cut hcDNA in the repetitive region only, with flanks of about 10 bp of the CA sequence being resistant to digestion. With P1 nuclease the middle of the repeat is somewhat less accessible to the enzyme. The presence of HMGB1 reinforces this pattern. Enzymes used as structural probes are high molecular weight molecules that sense the nature of the substrate as well as its steric accessibility. Small molecules are less influenced by steric effects, and are thus very useful for structural studies. We have used hydroxylamine, which reacts with cytosines residues in a manner that allows alkaline cleavage of the backbone. Hydroxylamine is very reactive with single-stranded DNA and practically unreactive with double-stranded DNA having a uniform structure, except at structural discontinuities (for example at B-Z junctions [27, 28]). Figure 4 shows the result of an experiment where hcDNA was probed with hydroxylamine in parallel with linear DNA as a control. The results are similar to the results obtained with S1 and especially with P1 nuclease: two sensitive regions are found in the poly(CA)·poly(TG) tract around positions 20 and 48, with a decrease in sensitivity in the middle and a complete lack of reactivity on both sides of the repetitive sequence as well as in the flanking non-repetitive sequences. 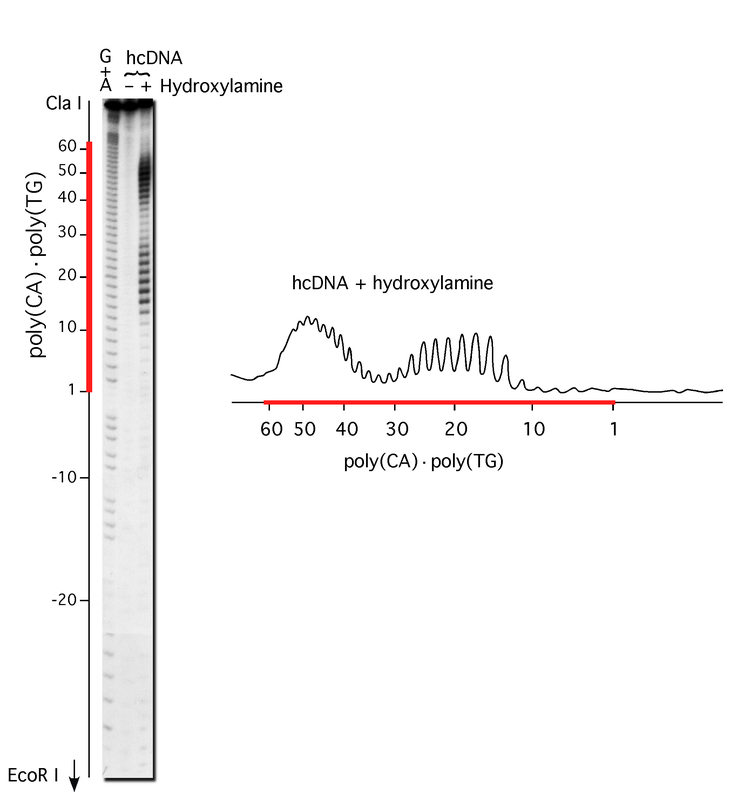 Analysis of hcDNA with hydroxylamine. hcDNA was 5'-end-labelled at the Eco RI site and treated with hydroxylamine as described in Materials and Methods. G+A: G+A size marker; (-): control, no hydroxylamine added; (+): sample incubated with hydroxylamine. A scan of the hydroxylamine-treated sample is also shown. Even though the lack of sensitivity on the sides of the repetitive sequence was not expected, it is immediately obvious that these results are in good agreement with the model of a hemicatenated loop (Fig. 1), which predicts the presence of two open regions flanking the center of the repetitive sequence. To try to get more structural details allowing us to refine the model we also used other reagents to probe hcDNA. DNase I cuts double-stranded DNA with little sequence-specificity and cuts unpaired single-stranded DNA only very slowly. DNase I was used to digest total hcDNA as well as the five major hcDNA bands purified from a preparative 8% polyacrylamide gel, in an attempt to gain some information on the structural difference between these bands (Fig. 5). Here again, no difference can be seen between hcDNA species and linear DNA outside of the repetitive region. Inside the repetitive region DNase I cuts hcDNA with a modulation of the cutting pattern along the repetitive tract, confirming that this region is not entirely in B-DNA conformation. This modulation is more pronounced with the more retarded bands from the preparative gel (bands 1 and 2), suggesting that these are the ones in which the double helix inside the loop is the most distorted. At first glance the modulation of the pattern may seem to present some regularity, but a closer examination failed to reveal a well-defined periodicity. In addition, the regions that are preferentially cleaved are not the same from one band to another (compare e.g. bands 1 and 2). This modulation in the cutting pattern will be discussed later in the light of the possible models for hcDNA formation. Analysis of hcDNA with DNaseI. hcDNA was 5'-end-labelled at the Eco RI site and fractionated on a preparative 8% polyacrylamide gel as shown on the left on the Figure. Material from each gel slice was eluted, digested with DNase I, and analyzed on a denaturing polyacrylamide-urea gel. For each sample a control, labeled (-), was also loaded on the gel. Samples are: G+A: G+A sequencing reaction as a size marker; ds: double strand in the regular B-form conformation; 1–5: hcDNA, slices 1 to 5 of the preparative gel. Scans of the DNase-digested samples are shown. We have recently imaged with AFM hemiknot DNA structures with different repeat lengths . 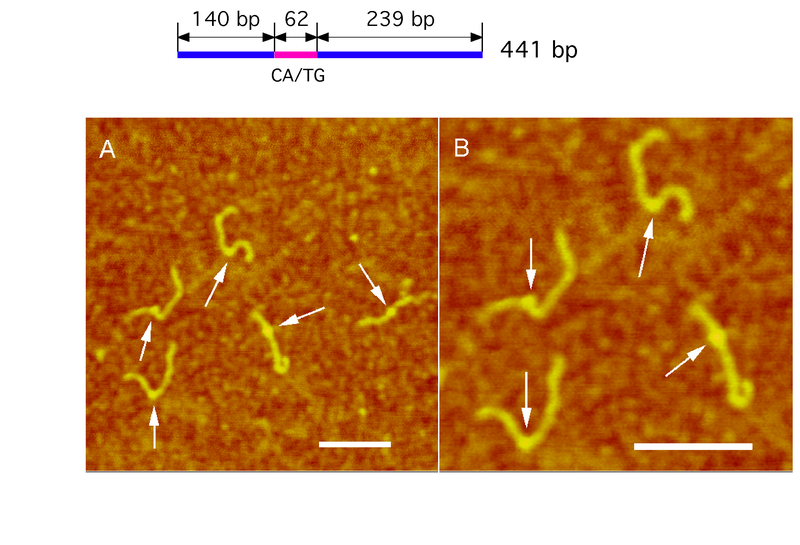 Since the size of the fragment used for footprinting studies, 120 bp, was too short for AFM, a 441 bp fragment from the same plasmid and therefore containing the same repetitive tract was used for AFM imaging (see map on the top of Fig. 6). A small-scale AFM image of hcDNA molecules prepared with this fragment is shown in Figure 6A and a larger-scale image is shown in Figure 6B. The common feature of all the molecules is the presence of clear bright blobs indicated in the images with arrows (see also ). Some of the molecules have clear kinks at the blob locations. The analysis of the AFM data led to the conclusion that the blobs are located at the CA/TG insert positions and indicated an average of 39 bp for the contour length reduction between hcDNA and the linear fragment . Analysis of hcDNA by atomic force microscopy. AFM images of hemiknot DNA formed by a 441 bp fragment containing a 62 bp long CA/TG repeat. The positions of blobbed features are indicated with arrows. The bar size on both images is 200 nm. hcDNA, an alternative DNA structure obtained by reassociation of the strands of a DNA fragment containing a tract of poly(CA)·poly(TG), is composed of a population of stable conformations. 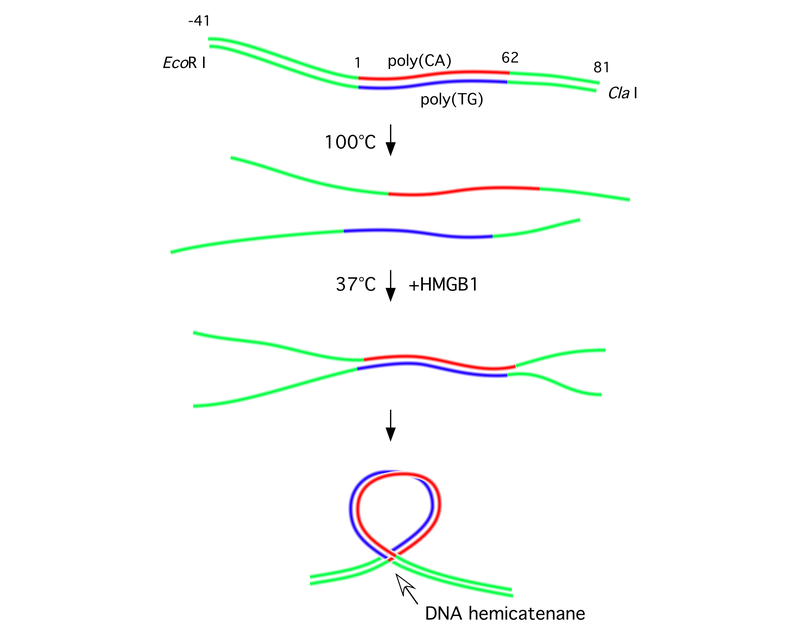 On high resolution polyacrylamide gels, hcDNA is resolved in a series of defined bands each of which contains both strands of the DNA fragment in equal amounts, the possibility that some of the bands contain only one of the single strands or a triple-stranded structure can thus be ruled out. The similarity of all the bands may only be apparent and should not be taken to imply that all the bands share the same basic structure, especially in view of the fact that no interconversion between the different bands could be observed under the conditions used. On the other hand however, given that about 10 bands could be resolved which all contain knotted structures, it is unlikely that they all consist in different structures, instead it seems likely that many of them share the same basic conformation, while differing by some parameters of the structure. In agreement with this suggestion is the fact that the experiments performed on isolated bands gave results similar to those obtained with the bulk of hcDNA. The situation would then be somewhat similar to topoisomers of a circular DNA molecule of a given size, where moderate changes of a single parameter of the structure, in this case the DNA supercoiling density, can lead to a series of bands with markedly different electrophoretic mobilities on concentrated polyacrylamide gels. For example in the model which was proposed for hcDNA of DNA loops maintained by a hemicatenane at the DNA junction at the base of the loops, several parameters of the structure can vary, including the precise size of the loop, the winding of DNA inside the loop, and the loop position along the DNA sequence. With an overall structure remaining globally the same, such minor variations should be expected to lead to quantized changes in electrophoretic mobility. In particular, the loop size should have an important effect on the mobility in high percentage gels, even more than with DNA minicircles since different loop sizes might result in variations of the angle between the two arms. Consistent with the model, it is interesting to note that the absence of interconversion between the different forms which is observed here is no longer true at higher temperatures, since some changes in the pattern of bands of hcDNA with ends closed by ligation of hairpin oligonucleotides are observed upon incubation at 100°C (see Fig. 4 in ). The data obtained with nucleases S1 and P1 and with hydroxylamine are also in excellent agreement with the model (Fig. 1). In the hemicatenated DNA loop, two regions of the DNA duplex are open since in the junction one strand of each duplex passes between the strands of the other duplex. The model thus predicts the existence of two sensitive regions, on each side of the loop, flanking a region of lower sensitivity which comprises the loop. This is exactly what is observed in the experiments with P1 nuclease and with hydroxylamine. S1 nuclease gives similar results, except that no reduction of sensitivity is observed in the center of the repeat, which may be due to the different pH conditions during digestion. At first, the results could also be interpreted as showing the presence of staggered denaturation loops on each side of the CA/TG tract, with one single-stranded loop on one side on the CA strand and another loop on the other side on the TG strand. Such a model can be excluded, however, on the basis of our previous data on the topology of DNA strands in hcDNA . In particular, measurements of the DNA linking number in circularized hcDNA , and data showing that hcDNA molecules with their ends covalently closed by ligation of hairpin oligonucleotides are absolutely stable and are resistant to denaturation both by heat and by sodium hydroxyde , are absolutely incompatible with this hypothesis. Actually, in all our experiments with DNA fragments containing a CA microsatellite, we have never observed a structure that might have corresponded to staggered denaturation loops. It is very likely that if such structures exist they are extremely unstable; sliding of the loops requiring no energy they can rejoin very easily to reform the fully base-paired double-stranded fragment. Other models can be considered as long as they take into account the presence of a knot in the structure. 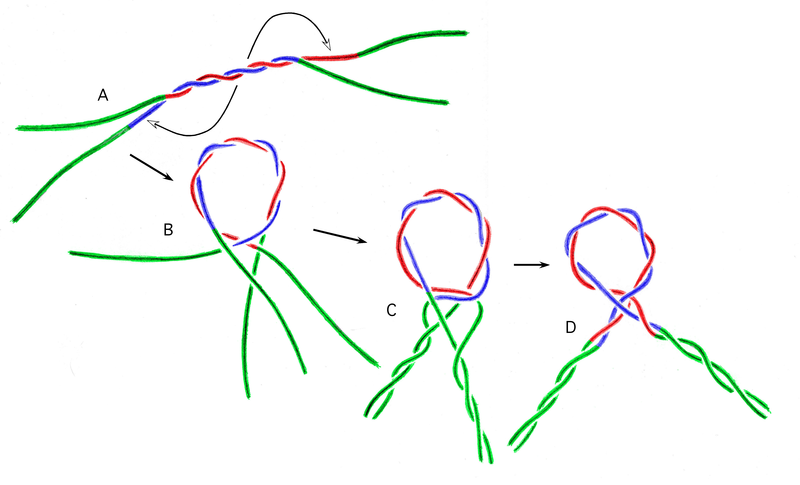 For example, given the extremely short persistence length of single-stranded DNA, the possibility exists that a knot forms on one of the strands and becomes trapped by the reassociation of the opposite strand. The presence of a knot, by locally preventing the complete reassociation of the strands, would lead to the formation of regions sensitive to single strand-specific reagents, as observed. In such a case, however, the important flexibility of single-stranded DNA should be expected to favor the formation of loops significantly smaller than the length reduction observed by AFM. And in this model it is more difficult to explain than in a shifted-pairing model why the unpaired regions are strictly restricted to the repetitive sequence. The loop size is particularly small in hcDNA. With a length of 62 bp for the CA/TG tract, the data obtained with single strand-specific reagents suggest a loop size of less than 40 bp which is in good agreement with the average of 39 bp from length measurements of AFM images . This strong curvature of DNA cannot be opposed to the model, however, since DNA is known to accommodate highly curved structures. In the nucleosome, DNA makes 1.7 turn for 146 bp, i.e. 85 bp per turn . And in crystals of some complexes of DNA with proteins much important deformations of the double helix are frequently observed, resulting in strong kinks or writhes of DNA localized on regions which can be just a few base pairs long . Therefore a very strong curvature is well tolerated by DNA as long as it is stabilized by proteins or by circularization. As discussed previously , the formation of loops much smaller than the value of 150 bp for the persistence length of DNA  is probably due to the flexibility of poly(CA)·poly(TG) [32–34] and to the fact that HMGB1 facilitates strongly the circularization of short DNA fragments [35, 36] since DNA fragments as short as 59 bp could be circularized by T4 DNA ligase in the presence of HMGB1 . Thus the small size of the loop is not in contradiction with the model, but it provides a possible explanation for the variations of the pattern of digestion with DNase I, since the constraints induced by such a curvature cannot be without any influence on the sensitivity of DNA to the enzyme. The presence of two regions on the sides in the repetitive sequence which are not sensitive to the single strand-specific enzymes and reagents was not predicted by the initial model (Fig. 1). This suggests that the junction is never localized on the sides of the repetitive sequence but is at a distance of at least 10 nucleotides from each border between the repetitive and non-repetitive sequences, and has implications as regards the mobility of hemicatenated junctions along the DNA molecule, as well as the mechanism of formation of the loops. First, this observation suggests that under the conditions of the experiments the hemicatenated junction cannot move by translation along the DNA sequence in hcDNA, and in particular that it never moves outside of the CA/TG sequence, confirming our previous AFM observations . This assumption is also supported by the fact that no interconversion between bands is observed (Fig. 2), implying that even inside the repetitive region no displacement of the junction can occur. A likely possibility is that such displacements are made difficult by the fact that the inside strands in the junction are strongly held between the opposite strands, like in clamps. The loop size being smaller than the size of the poly(CA)·poly(TG) sequence may be linked to the mechanism of formation of the structure. The mechanism suggested initially  was based on shifted pairing of the DNA strands. The present data support a more detailed model (, Fig. 7). After an initial shifted pairing of the poly(CA) and the poly(TG) strand, some unpaired single-stranded poly(CA) remains on one side, with an equal length of single-stranded poly(TG) on the other side (Fig. 7,7A). Provided that the two remaining single-stranded CA and TG regions are long enough, they can pair and contribute to the looping of the structure and to the formation of a transient intermediate in which the non-repetitive sequences remain unpaired (Fig. 7,7B). As a subsequent step, base pairing of the complementary non-repetitive sequences occurs at both ends, which clamps each inside strand in the junction at the base of the loop and ensures the stability of the structure (Fig. 7,7C). This should eventually be followed by a rearrangement of the structure to maximize base pairing all along the structure (Fig. 7,7D) since the DNA winding inside the loop can vary. It should be noted that once the structure is closed the DNA linking number in the loop is the only parameter that can no longer vary, since it is fixed by the topology of the strands at the moment of loop closure. Model for the mechanism of formation of hcDNA. The central poly(CA) and poly(TG) sequences of the DNA fragment are represented in blue and red, the terminal non-repetitive sequences are in green. After denaturation, reassociation of the strands of the DNA fragment can occur either without a shift, thus reforming the initial fragment in its regular linear conformation, or with a shift, resulting in an intermediate in which the CA and TG strands are only paired on part of their length, leaving a stretch of single-stranded poly(CA) on one side and an equal and complementary length of single-stranded poly(TG) on the other side (arrows), plus the single-stranded non-repetitive sequences at both ends (A). In the presence of HMGB1, this intermediate can fold and form a loop when one of the single-stranded repetitive sequences inserts in the fork formed by the two single strands at the opposite end and pairs with the complementary single-stranded repetitive sequence (B). The hemicatenane thus formed is then stabilized after reassociation of the non-repetitive regions at both ends of the fragment (C) and rearrangement of the structure to maximize base pairing (D). During the initial steps (Fig. 7,7A,7B), the length of the repetitive sequence, 62 bp in the experiments shown here, is probably sufficiently short to prevent the formation of hairpins as observed upon reassociation of long strands of poly(CA) and poly(TG)  and of the complex hemiknot structures observed with a 188 bp CA/TG repeat . The precise mechanism of the next step, which follows the initial shifted pairing of the CA and TG strands, will have to be investigated. In particular, the presence of the central double-stranded region should interfere with the winding of the single strands on the sides (Fig. 7,7B) and prevent the formation of a regular B-form double helix in this region of the structure, as already suggested by the diversity of AFM images of hemiknots obtained with a fragment containing a 185 bp CA/TG insert . During this step, the DNA conformation at the base of the loop might be reminiscent of form V DNA  and involve some left-handed parts  since poly(CA)·poly(TG) is known to convert easily to Z-DNA [40, 41]. Studies performed currently with other repetitive sequences that do not convert to Z-DNA easily should bring information on this point. Finally, an additional possibility to explain the stability of the hemicatenated DNA loops and the fact that translations of the loops are not observed is that base pairing might occur between the opposite single strands inside the junction and contribute to its stability. Indeed, two regions that were initially distant on the linear molecule are brought into close proximity inside the junction, and the possibility that some base pairing occurs between these sequences is particularly interesting since it would allow direct, stable, sequence-specific interactions between two distant regions of the double-stranded DNA molecule. High-resolution electrophoresis, enzymatic and chemical probing, and atomic force microscopy, are in agreement with the model of hemicatenated DNA loops which was initially proposed  and support the mechanism suggested for the formation of these structures [7, 8]. Shifted reassociation of the strands of DNA fragments containing a tract of the poly(CA)·poly(TG) microsatellite leads to the formation of DNA loops maintained at their base by a hemicatenated junction located in the repetitive tract. A novel possibility is thus offered to prepare DNA hemicatenanes, providing a new way to study the possible function of hemicatenanes in processes such as recombination and replication which involve the formation of alternative DNA structures. Finally, the data suggest that the partial opening of DNA helices inside a hemicatenane might allow for sequence-specific interactions between two distant regions of the DNA molecule. DNA fragments were extracted from plasmid pE10 (accession number X96980) amplified in E. coli. This plasmid contains a tract of 62 bp of poly(CA)·poly(TG) inserted in the polylinker of pUC19. After digestion by the restriction enzymes Eco RI and Cla I, DNA fragments were purified by polyacrylamide gel electrophoresis and electroelution. The map of the fragment is shown on Figure 1. For most experiments, DNA fragments were dephosphorylated with alkaline phosphatase and labeled at their 5' end using polynucleotide kinase in the presence of [γ-32P]-ATP. For the experiments with S1 nuclease, as this enzyme shows a strong preference for the end of fragments which would lead to a quick loss of the 5'-32P label, DNA fragments were labeled with the Klenow fragment of DNA polymerase I in the presence of [α-32P]-dATP. DNA hemicatenanes were prepared and purified as described previously . In brief, the strands of the labeled DNA fragment are separated by thermal denaturation and reannealed at 37° in the presence of protein HMGB1, yielding the complex of hemicatenanes with HMGB1. After chloroform extraction to remove the protein and ethanol precipitation, hemicatenanes are purified by preparative polyacrylamide gel electrophoresis and electroelution, with a global yield of 5–10%. Two kinds of gels were used for the fractionation and purification of hemicatenated loops. Low resolution gels were 4% polyacrylamide gels (acrylamide:bis-acrylamide 29:1) in 6.7 mM Tris-acetate, 3.3 mM Na-acetate, 1 mM EDTA, pH 7.8, at 4°C with buffer recirculation. High-resolution gels were 8% polyacrylamide gels in 40 mM Tris-acetate, 20 mM Na-acetate, 1 mM EDTA, pH 7.8. On 8% gels the electrophoretic mobility of hemicatenated loops is much lower but they give a much better separation of the different conformations (see Fig. 2). For two-dimensional electrophoresis, the slice of the first dimension gel was cut and loaded on top of the second gel, either directly, or after a 5-min incubation in electrophoresis buffer at 100°C to denature DNA. Treatment of DNA with hydroxylamine and subsequent cleavage by piperidine at the level of modified bases were performed as described . Aminopropylsilatrane-mica (APS-mica) was obtained by the treatment of freshly cleaved mica (Asheville-Schoomaker Mica Co., Newport News, VA) in 50 mM solution of aminopropyl silatrane as described earlier . The AFM imaging procedure has been described elsewhere [43, 8]. Briefly, DNA samples (3–5 μl) were placed onto APS-mica for 2 min, and the mica was rinsed with deionized water, after which the specimens were dried in an argon flow. Images were acquired by MM SPM NanoScope IIIa system (Veeco/Digital Instruments, Santa Barbara, CA) operating in Tapping Mode in air at ambient conditions using OTESPA probes (Digital Instruments, Inc.). This research was supported by the Centre National de la Recherche Scientifique (CNRS), Université Pierre et Marie Curie (Paris 6), and Université Denis Diderot (Paris 7). CG and FS carried out the biochemical studies, LSS and YLL carried out the atomic force microscopy analysis, FS drafted the manuscript. All authors read and approved the final manuscript.